You can tour on any bike barring the electric ones. That said there are definitive choices though depending upon the duration, severity, rider demand, terrain and expected weather conditions that shall define the tour. But then again, there can be exceptions. People here do a couple of thousand kilometer rides on small 100cc commuter bikes! So as far as the mechanical capability of a motorcycle goes, almost any bike can go any distance. Just keep a simple thumb rule in mind which goes like this: ‘Use any vehicle within about 80% of its peak performance limits and you probably will not ever see it give up on you’. In simple terms it means that if a motorcycle can attain a top speed of 100 kph, ride it below 80 kph and it’ll stay on for a long time. It’s the upper 20% that puts the most loads on a machine and that’s where it loses on life and reliability. Actually in the context of engines, its about limiting the engine RPM’s to below 80% of the red-line. This 80% figure admittedly has no ‘scientific basis but arises from years on the road covers almost three-quarters of a million miles on a wide variety of machines. Power: the more there is the better off you’ll be. Why? Because 1) The more power you have in reserve, the less you need to stress the engine to get acceptable performance. And a less stressed engine will improve its reliability as well as reduce fuel consumption. 2) more power means you’ll still have enough left-over when loaded with luggage and a pillion. Torque: The more torque you get at low rpm’s, the better it is as it’ll give your bike good climbing ability at low speeds, it pulls away easier from stops and has enough gumption to get you through muck or sand that will definitely bog down a low powered bike when its loaded with luggage and a pillion. Handling: You definitely need a bike that handles well and in predictable manner. 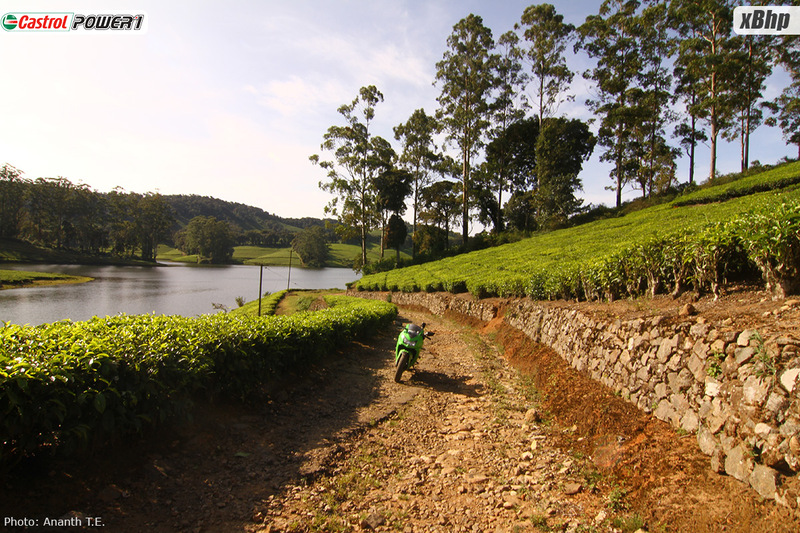 As a tourer you’ll probably ride on a vast variety of roads and road conditions. While those long straights in the plains demand great straight line stability, those twisties in the hills will make you desire a quick flickable bike. The ideal choice would be a mix of both and since incidentally most motorcycle tourers are out to ride and not race, a compromise on either is not such a disappointment eventually. Also, a well-sorted bike is less stressful to ride, both physically and mentally as it does not need constant corrective inputs and the rider can afford to relax a little while riding. Too responsive and twitchy a set-up is fine for a couple of hours of tarmac thrashing but for a long chain of long days on the road, a more relaxed set-up is not just good but a necessity. Braking: Disc brakes are common, very effective and extremely useful, whether cruising at speed or doing the twisties. They are powerful, don’t fade as quickly as drums and are very reliable. At least the front needs to be a disc as one can live with rear drums without any appreciable loss in braking prowess of the bike. Reliability: An aspect of utmost importance. Touring is about the freedom of choosing destinations that you want to ride to and not that your bike can be fixed at. If your touring plans get defined by the availability of spares and service of your bike, then you’ll probably be more into glorified commuting than actual touring. 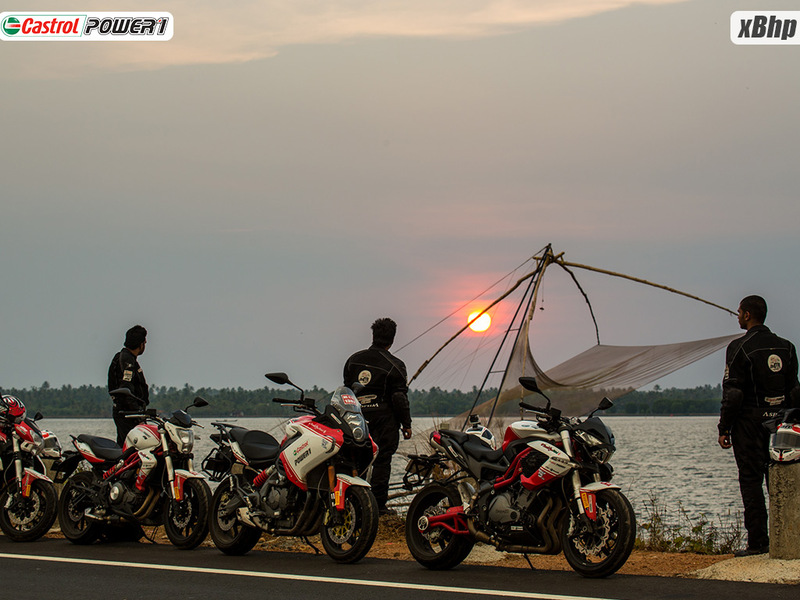 The motorcycle’s reliability is actually a major factor in the pleasure you get from touring on it. 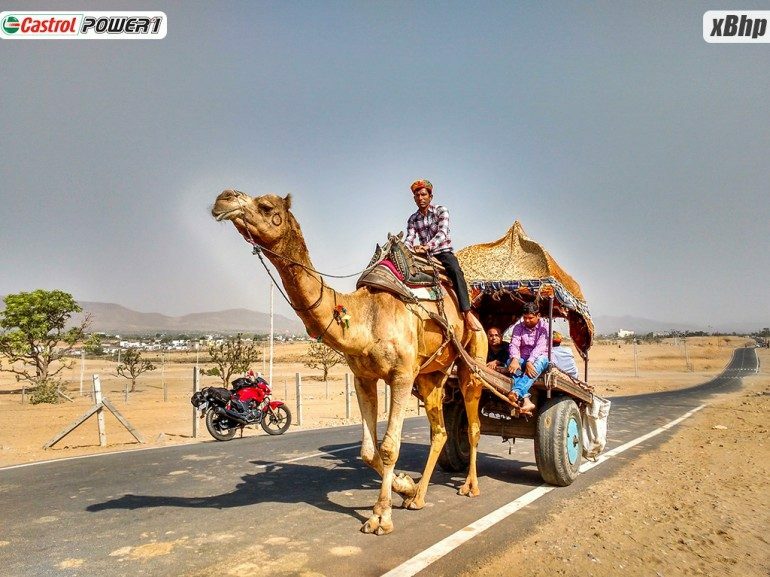 At times, especially in those remote mountains or far into the desert regions, far from expecting knowledgeable and well-equipped help in fixing a bike gone kaput, you’ll rarely find another soul on certain stretches. So look for a motorcycle that has a good record on reliability. Ruggedness: Those really enjoyable and memorable motorcycle tours are the ones where both you and your bike were pushed to the limit. Neither broke and you returned feeling a better man and carrying a wonderful sense of achievement. No amount of mental resolve or physical toughness on the rider’s part can fix a broken frame or collapsed suspension. If something that big and important breaks, you don’t even have the option of walking and dragging the bike left with you. So look for a proven rugged bike for your touring. Tank Capacity/Range/Fuel Economy: This is important and can be the defining factor at times, for example on a tour to Ladakh where petrol stations can be hundreds of kilometers apart. Well, you can buy fuel in ‘black’ at places but then there’s no guarantee of its quality or what it’ll do to your engine a few miles down. So good fuel efficiency and large tank capacity give you the kind of distance reserves that could someday even save your life. Tyres: Dual purpose tubeless are fast becoming the unanimous choice amongst bikers, all the more so if the ride involves a fair bit of broken tarmac, dirt roads, slush, sand and at times even snow. The dual purpose tread pattern gives good grip and traction in off-road conditions including in soft snow is acceptably good. Tubeless tyres are not prone to sudden deflation and they have a tendency to lose air slowly which can be a boon and a life saver on this ride. Also, repairing them by the road-side is a relatively easy job provided you have the means of re-inflating them at hand. (see checklist for ‘vital tools to carry’). The only downside with tubeless compared to tubed tyres is the tendency for the former to lose air in case the wheel rim gets dented for some reason. Weight: Ideally, you will be the best off with a powerful bike that makes lots of torque at low rpm’s, is reliable, rugged, has a range of at least 450kms unrefueled and is light in weight. Well, the ideal conditions are usually a bit distant from reality and weight is something you have to live with. Of course, the lighter bikes make it easy for you to wrestle them through tough water crossings, sand, slush and most importantly in picking it up in case of a fall. 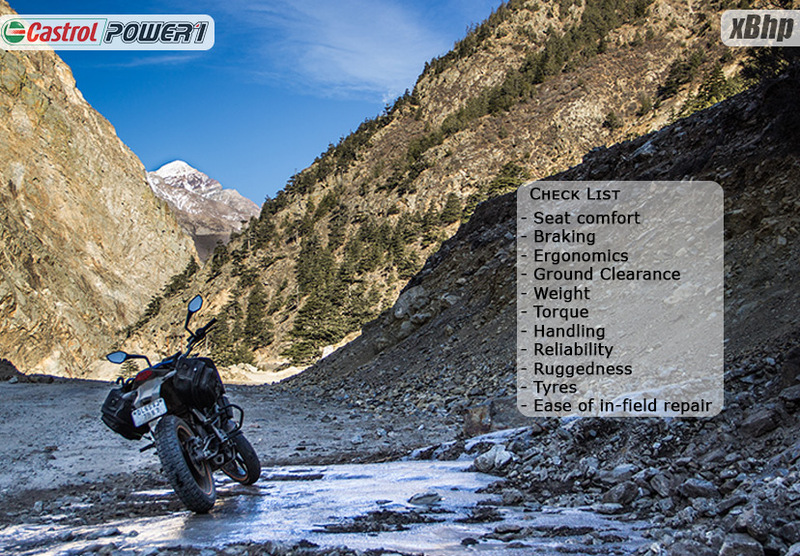 Choose light weight but not at the cost of power, torque, reliability, ruggedness and range. Ground Clearance: This depends upon the kind of touring you usually plan to do. Up in those rugged mountains or exploring those little known back roads somewhere will definitely put badly broken roads under your tyres at some point of time. At times, a short but really dug up stretch can actually make or break your well-made tour plans and that extra bit of ground clearance can really help you get across. The only downside of high ground clearance in bikes is the resulting higher center of gravity of the bike that makes it top heavy and a handful on curves. They said life is about choices at every step eh? Ergonomics: How good is the physical match between you and your bike? For a simple handlebar-foot-peg compatibility check with your physique, put the bike on its main-stand, sit on it, close your eyes and reach out for the handlebars. If the end-grips fall naturally at hand for you, then the ergo’s are spot-on for you. Bad ergonomics, say those that make you crouch or reach farther than what your natural stance permits will be a pain to ride for long hours and for days at stretch. Seat comfort: A happy bum makes you a happy bum! The seat is something that will probably need some extra padding up with firmer foam. Usually the stock foam is too soft for long hours on the saddle. As a matter of rule, if it feel comfortably soft on your first ‘sit-down’ on the saddle, it’s too soft for touring. But then those lighter in weight will not find this that big an issue. It is a matter of how much weight you put on the seat per square inch. So that’s another reason to lose those extra kilo’s before such a ride. Ease of in-field repair: Reliability is no guarantee for zero failure. 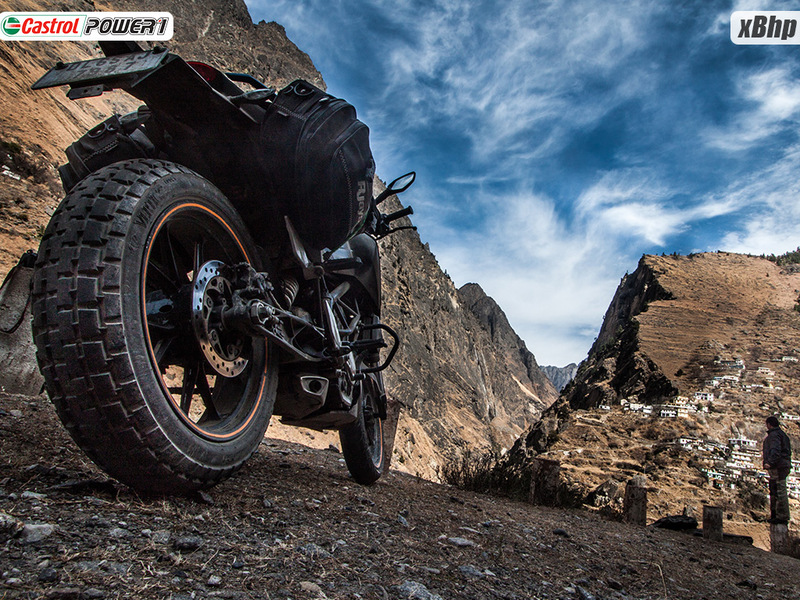 And a bike that is easy to fix on the road is a boon on such rides to remote places. The bullet scores on this as do quite a few of the Japanese designs. As a thumb rule, any bike that does not require any special tools to change its control cables, clean the air filter, adjust those tappet clearances and tune the carburetor should be the choice. Because for any other more serious issues, you’ll probably need to get the bike carried to a workshop anyways. Like I stated earlier, DIY can be a safety issue! Select a motorcycle that has a consistent record of reliability over long hours of operation. And it should also return good miles per liter of fuel as frequent stops for refueling are not only time-consuming but also a major distraction (the absence of proper updated maps with fuel-stations marked makes planning difficult and you do eventually end up searching for one). Carrying fuel is an option but then with the kind of low-powered bikes we get to ride here in India, any weight addition will be to the detriment of the bike’s performance. And of course carrying fuel, say in plastic containers, can be a hazard in case of a mishap as the petrol can spill and create a fire hazard. The bike should be ergonomically right for you. 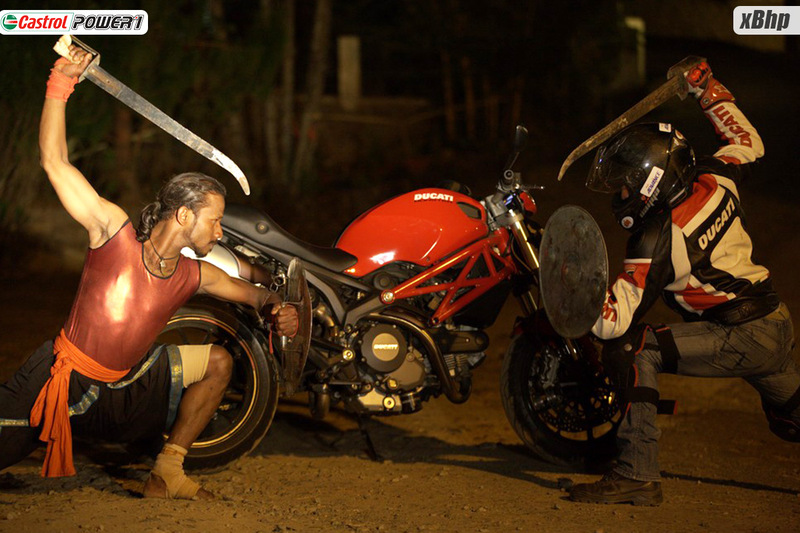 Make sure the seat – foot-peg – handlebar relationship is just right for your physique. And the only way you can find this out is by going on a long ride on the bike before attempting an endurance run. Bad-posture induced aches and pains in the joints, neck and back can mean the difference between completing the ride and giving up mid-way. The bike should be relatively easy to repair for small issues. For example, a puncture should be easily repairable; changing the headlamp bulb should be easy as is the case with lubricating the chain or checking on the brake pads etc. Of course, you need to be thoroughly familiar with your steed to be able to make use of a repair-friendly design. Start out with tyres and wearable parts that have at least 3 times the miles in them than what you’ll do during your ride. Renew the tyres, brake pads, control cables etc a few days before the ride (to allow them to ‘bed-in’) and change engine oil a day or two before the big day. But follow the golden rule of not getting work done on your bike just a day before the ride. Use the bike for a while after its been serviced or worked upon to allow for any issues resulting from the fiddling to come forth. Also choose the time of the year carefully. Hot summers are a strict No! No! for such long rides. The risk of overheating the bike, a tyre bursting due to sustained speeds on hot tarmac or dehydrating yourself make the hot days just not worth it. Extreme winters like up north are again a problem, what with short day-light hours, presence of fog and the extreme cold induced due to wind-chill on the bike. The rainy season is again ruled out for obvious reasons. Usually for a country like ours, the mid-season months work the best though for those living southwards, the ride window is pretty wide, almost 8 months of the year. Full riding gear is more than necessary for such rides considering the heightened risk involved. A proper premium helmet with a scratch free visor, armor-equipped jacket, motorcycling gloves and boots, knee guards or better still armor-equipped riding pants are a must. Renting a bike – Rental amounts ranges anywhere between Rs 400/- to Rs 1000/-. It depends on season, condition of bike, model of bike and mood of the shopkeeper. Duration of rental period varies from two days to four months. Needless to say, the rent per day reduces as the rental duration increases. Some shops also allow you to buy the motorcycle from them and they buy it back from you at the end of the ride. This is only for those who want to rent a bike for an exceptionally long period of time. Because the repurchase value is at the sole discretion of the shopkeeper, with a minimum of 20% depreciation.